Tip #1: "Use the YouTube keyword research tool!" Did you know that YouTube has its own keyword research tool? No, it's not Adword keywords which we use to find niches, it's something which YouTube has built specifically for videos because people use different terms when searching for videos than when searching the web. For example, if someone is searching for "cake" on Google, it will show you the shops in your area or places you can order a cake - but when you search for "cake" on YouTube it will show you recipes on how to bake your own cake. Ask yourself before uploading your video, how much time did you spend on keyword research? It is probably the most important and most overlooked thing when it comes to video marketing. Never forget that a video that doesn't show up in search results, no matter how good it may be, isn't very useful. So remember to thoroughly research your keywords! Tip #2: "Don't tell too little or too much!" Article Video Robot videos work great when they are short and simple. You need just enough good content to hook in a prospect but don't tell it all! When you tell too little, people lose interest and feel somewhat cheated. On the other hand if you try to tell them everything, then they won't click your link in your video's description and you won't get any traffic to your website. Never forget that the whole point of creating videos is to generate free leads and traffic. You want to pique their interest just enough so that they are interested in learning more, which encourages them to click that link to your website in the description. Tip #3: "Create an interesting title for your video"
Your video needs to stand out in the YouTube search results. Take a look at the most popular, most viewed video in your niche and you will always find that the highest ranked videos have the most interesting and relevant titles. Your video title is as important as the headline of a sales page. Need free leads and traffic? Try this amazing new software.. Tip #4: "Use custom thumbnail for your video"
Apart from your title, the other thing that a person gets to see in the search results is your video thumbnail. Do you know how YouTube generates the thumbnail for your video? Many people don't know this but your thumbnail is generated using the frame which is exactly in the middle of your video, so if your video is 4 minutes long, the thumbnail would be the frame at 02:00. This is the reason why people insert attractive photos in the middle of their videos to get the best looking thumbnails. Thankfully you don't need to resort to such extreme measures. If your account is somewhat old and it is in good standing, YouTube will give you the option to upload a customized thumbnail for your videos. Just make sure that it is relevant otherwise this privilege might be taken away from you. But believe me a good thumbnail can mean the difference between 10 views and 1 million views. Tip #5: "Add a call to action with your link in first two lines of description"
The Video description is where you earn your money. Right now it is the only way to get the viewer to your website. The first thing to remember about video description is that it is only 2 lines long, at least for your purpose. I say this because while you can write a whole 500 word article inside the description box, only the first 2 lines are visible to the viewer by default. You will be losing 99% of the viewers if your link is hidden inside the description box. So your first two lines are your most important real-estate which must be hand customized and must contain a call to action phrase with a URL linking to your site. So first line should be the call to action, the reason why a person should click your link, followed by your link. "Oh and one more thing you should know - [link]"
"But here is the best part I didn't cover - [link]"
"If you liked this, you will love reading this - [link]"
"Here is the 5th and most important tip - [link]"
"Read more about personal experience with [X] - [link]"
"Read my importantÂ update to this video here: [link]"
Tip #6: "Video Search Engine Optimization or Video SEO"
YouTube is not just a video sharing site, but also a video search engine. Optimizing videos for YouTube is just like optimizing your website for Google. Just like you have to optimize the title, content of your webpages, you have to optimize title, and description of your videos. Thankfully you don't have to worry about these internal workings of Google or YouTube. 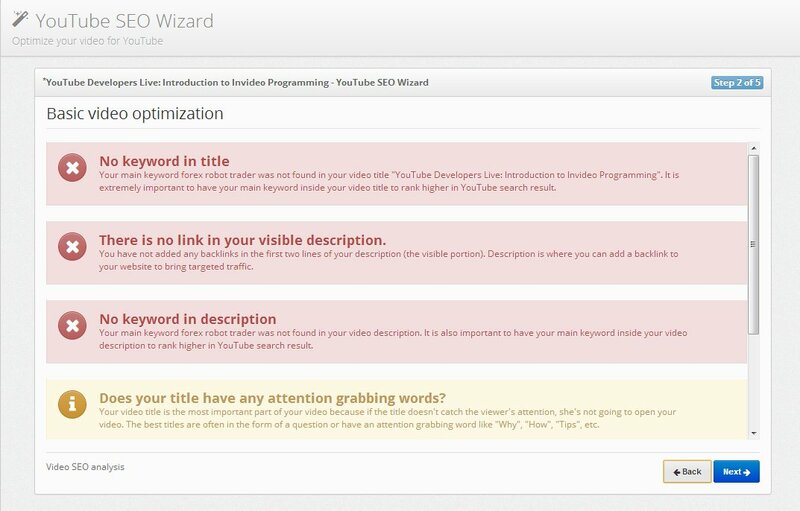 We have made things very easy for you by creating a YouTube SEO wizard. This new tool will benchmark your YouTube videos using 35 different Search Engine Ranking tests and give you concise and powerful suggestions to help you get your video on top of YouTube and Google search results very quickly. This is a very cool new way to boost your traffic and rankings from YouTube. Hope using these tips you will get even more targeted traffic and leads from Youtube. If you found my tips useful, please leave a comment down below. HowÂ has your experience been with Video marketing so far? What is your #1 tip for marketing on youtube? “first of all thanks everyone for the comments. “Been learning a lot about that lately. this article is a plus for me. “Simple but deadly effective tips... that most people override! “Wow, your video tips are awesome. I'm a relative newbie to Youtube, and you have really given me so much ammunition. Thanks so much! I have one question: In regards to the "arrow" pointing to the description, is this something I can do? Is there a tool to do this? Again, thanks so much for your help. “Oh my goodness! Incredible article dude! Thanks, However I am having issues with your RSS. “Great info. Re #1 tip, the Youtube keyword tool has been gone since Sept. 2014. Great articles, I'm new to youtube marketing, and need to know more about youtube video seo, would you please send me more links to such info on your website? “I just signed in for access to your video and have actually not tested it. Nonetheless, from the testimonials I have read so far, the software is a game changer when it comes to video marketing and advertising. 1,029,330+ marketing videos created by 114,691 article marketers From top Internet Marketers to small business owners, everyone uses and recommends Article Video Robot!